Some people are just born lucky, while others take risks that turn out to be the luckiest thing they’ve ever done. And that is most evident in places like in an online casino or online gambling site where people win and lose fortunes all day long. But sometimes we hear of a story that seems to defy the odds, and it makes us sit up and take notice. The story of Ashley Revell is one of those stories. Revell was out drinking with friends one night when they, in their drunken haze, begin to talk about what it would be like to go to Las Vegas and bet everything they had. And while the conversation was just one of those that people have when they’ve had too much to drink, it stuck with Revell. He thought about it in the next few days, and finally, much to everyone’s horror, he decided to do it. Revell was single at the time and he had many of the trappings that single men do. He had a BMW, a Rolex watch and some nice clothes. And so he began to sell it all. In fact, he sold everything he owned, and then rented a tuxedo so he’d have something to wear. He had $136,000 in cash to his name. Now for some people, that would have meant he could have lived for a few years without working, bought a small house, or opened a business and used it to earn a living. Revell took that $136,000 and went to Las Vegas. At this point in the story, you might anticipate that Revell played a few games at the table or made some large bets and won a pocketful of cash. But he was determined to bet everything he owned on one single bet. He says that the night before he was to place the bet, he slept like a baby. He just “knew” that he was doing the right thing, even though his parents and friends tried to talk him out of it. But they all travelled with him to Las Vegas and stood there as he tried to decide which color to bet on at the roulette wheel. The Casino boss explained to him that they didn’t condone anyone betting his life savings on a single bet, but Revell couldn’t be dissuaded. After the pit boss explained the rules of the game to him and spun the wheel, Revell quickly decided on red and moved his chips there. Revell walked into the casino that day with $136,000, but when he left, he had $272,000 in his pocket. How’s that for betting with your gut? 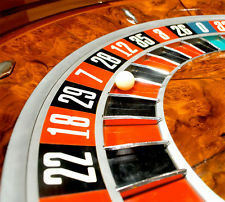 At the time, people predicted that Revell would continue to gamble because he’d been bitten by the “bug,” but that’s not what happened. He used his earnings to start an online betting company, which he called Poker UTD, but the company went out of business in 2012. But there is a happy ending to this story. With some of his winnings, Revell took a trip around Europe on the back of a motorcycle and met a girl in Holland. He is now happily married to that girl and they have two children together. “The whole experience taught me what is really important in life isn’t Rolexes or flashy cars, but sentimental things,” he later told a reporter. I guess the man’s luck really did continue.